After the intensive with Dan Cohen (BC programme director) on Saturday I’ve come up with a few theories about some changes we can expect to see in Combat – and my guess is we’ll probably see them from BODYCOMBAT 40. BC40 marks exactly ten years of the programme, so if you were going to make some changes that would be as good a time as any. Dan didn’t say anything specific other than that the programme is evolving and we can expect to see some changes. So here’s some of my ideas (bear in mind I literally have no inside knowledge and these are all just a shot in the dark). Change in ginga technique: There’s no gingas in BC39 so I’m picking from BC40 we see it back, and with some changes. Dan did hint that this could be the case. As far as I can guess they’ll be no lifting of the toe, less wrapping of the arm around the back of the body and it will be much truer to authentic capoeira form. Roundhouse kicks from the back leg? 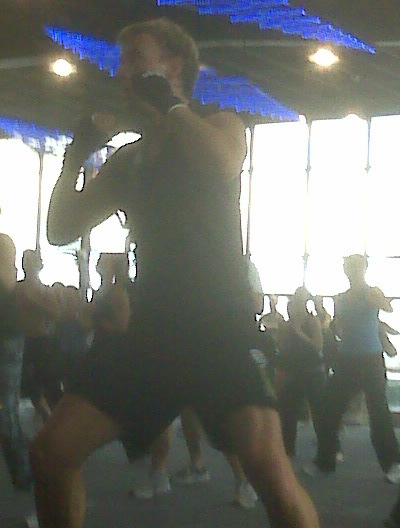 In BODYCOMBAT we only ever roundhouse off the front leg. As far as I can tell it’s a safety issue. Yet you can create so much more power off the back leg. My guess is we may start seeing roundhouse kicks from the back leg in BC40 too. There may even be moves like the “switch roundhouse”!! Now that would be cool! I could be way off base here, what are your thoughts? Be interested to know. No matter what I guess we’ll find out in a couple months at the BC40 filming! Oh my God what a night! 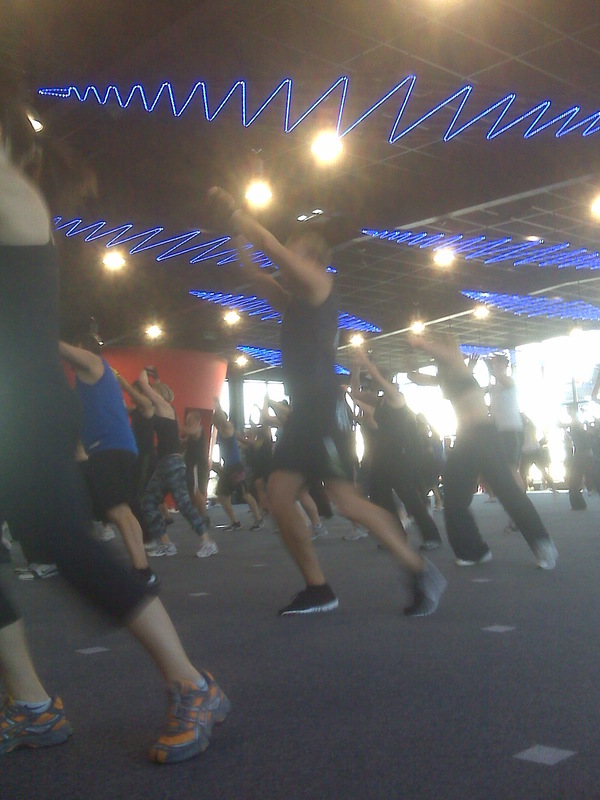 An absolutely packed class (I think we came close to setting the gym’s record… all up about 50 people!!). All the regulars, a few new people, plus other Combat, Pump and Step instructors from gyms all over town showed up in support. So many friendly smiling faces – how could I have possibly been nervous! Such an honour and definitely something I was never forget. The whole class (to me) seemed to last all of 7 or 8 minutes and was over much too quickly…. it was just a blur! One thing I will say is that many people made for one hot room – I was a red sweaty mess come the end of the muay thai track that’s for sure! After the class the assessor took me aside, her first words were “Well there’s absolutely no question you passed!” – was hard pressed stopping myself from cartwheeling around the gym at that point! Honestly the support I’ve received has been amazing and it truly made all the difference. From my trainer (Mel – you rock babe! ), family, friends, other instructors and messages of support from you guys – I jumped on stage thinking “I’ve got this nailed” and as a result didn’t make a single error. So thank you thank you thank you!!! 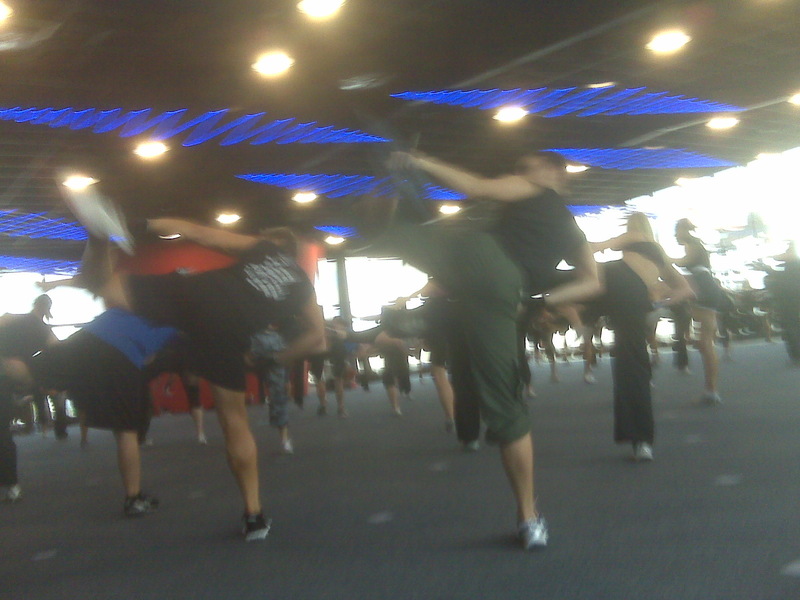 So tomorrow at 5:30 I have my BODYCOMBAT instructor assessment. Even though I’ve been instructing BC for a few months now (some classes alone, most team teaching), and passed module no worries – I’ve still got this last piece of the puzzle to complete before I’m officially “certified”. And I’ll be honest… I’m FREAKING OUT!! So much so I almost didn’t post this! Even though I’ve taken 4-5 BC classes per week for the last few months all these horrible thoughts were going through my head like “what if I don’t pass” – “maybe I’ll just post afterwards that I passed, and if I don’t I just won’t mention it!”. But hell, pressure is a good thing (what’s the saying “pressure makes diamonds”?) so I’m sucking it up and proclaiming it here that in about 24 hours (give or take) I’ll be in front of a live Les Mills assessor having my every move judged. The fantastic thing about my gym is that we have a live assessor come into the class and critique us live – and we get the result immediately after the class. The horrible thing about my gym is that we have a live assessor come into the class and critique us live – and we get the result immediately after the class!! 😉 I guess with a DVD you can watch it afterwards and worse case if you don’t like what you see redo it. That’s the one plus there. The downside, well there’s the 3-4 months of waiting for a result. I’ll post the outcome Thursday morning… good or bad I promise!